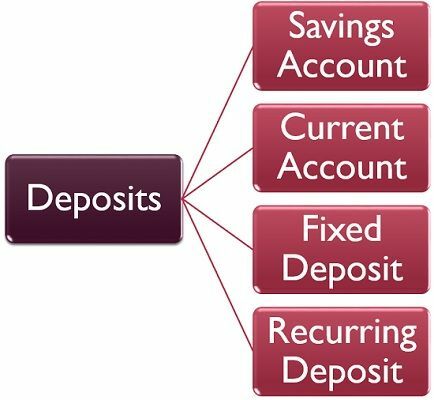 Definition: Commercial Bank can be described as a financial institution, that offers basic investment products like a savings account, current account, etc to the individuals and corporates. Along with that, it provides a range of financial services to the general public such as accepting deposits, granting loans and advances to the customers. It is a profit making company, which pays interest at a low rate to the depositors and charges higher rate of interest to the borrowers and in this way, the bank earns the profit. Private Bank: When the private individuals own more than 51% of the share capital, then that banking company is a private one. However, these banks are publicly listed companies in a recognized exchange. Public Bank: When the Government holds more than 51% of the share capital of a publicly listed banking company, then that bank is called as Public sector bank. Foreign Bank: Banks set up in foreign countries, and operate their branches in the home country are called as foreign banks. 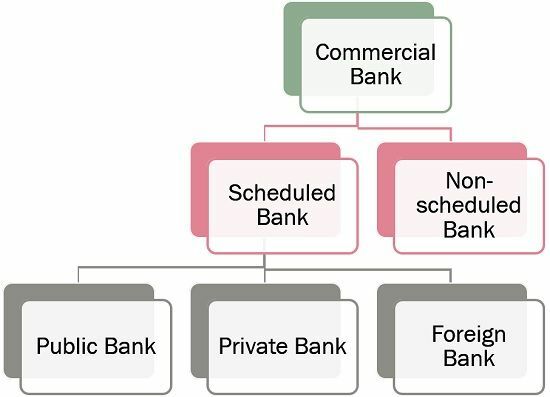 Non-scheduled commercial banks refer to the banks which are not covered in the Reserve Bank of India’s second schedule. The paid-up capital of such banks is not more than Rs. 5 lakhs. Accepting Deposits: The primary function for which the commercial banks were established is to accept deposits from the general public, who possess surplus funds and are willing to deposit them so as to earn interest on it. There are various products offered by the bank to the customers for the deposit of their money, which includes savings account, current account, fixed deposit and recurring deposit. 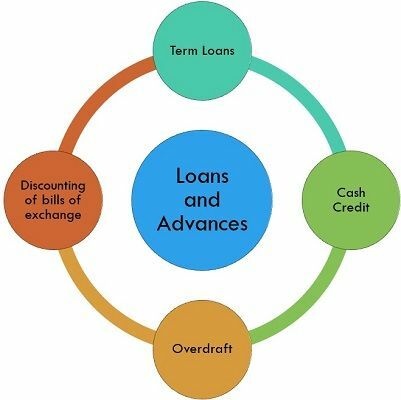 Advancing Loans: Next important function performed by the commercial bank is lending money to the individuals and companies. The banks make loans to the customers in the form of term loans, cash credit, overdraft and discounting of bills of exchange. Collection and payment of rent, interest and dividend. Collection and payment of cheques and bills. Payment of insurance premium and subscriptions. Safekeeping of valuables, documents etc, in locker or vault. ATM card, credit card and debit card facility. Issue of demand draft, pay order and traveller’s cheque. Sale of application forms of competitive exams. Transfer of funds: Banks assist in the transfer of funds from one person to another or from one place to another through its credit instruments. Credit Creation: The commercial banks are authorized to create credit, by granting more loans than the amounts deposited by the customers. A commercial bank offers an array of facilities such as internet banking, mobile banking, ATM facility, credit card facility, NEFT, RTGS and so forth for which it charges a definite sum as a fee for providing these facilities.